INDIANAPOLIS, IN - Music for All, one of the largest and most influential national music education organizations in support of active music-making, announced the creation of a new national music parent and booster award during its 2007 Bands of America Grand National Championships in Indianapolis. The Patrick John Hughes Parent/Booster Award will annually recognize the extraordinary support, involvement and contributions of music parents and boosters by shining a spotlight on a recipient who exemplifies these qualities. The award was announced Friday evening, November 16 at the Grand National preliminary awards ceremony. Patrick John Hughes is the father of Patrick Henry Hughes, a remarkable young man who was born without eyes and without the ability to fully straighten his arms and legs, making him unable to walk. Additionally, two steel rods were surgically attached to Patrick's spine to correct scoliosis. Despite circumstances that seem overwhelming to many, Patrick has overcome these physical issues to excel as a musician and student. Patrick started playing the piano at the age of only nine months, and also plays the trumpet and sings. 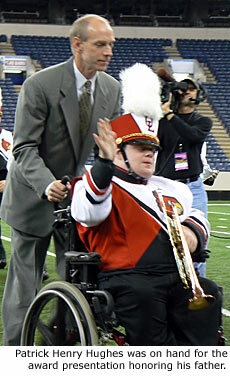 He even participates in the University of Louisville School of Music Marching and Pep Bands with help from his father, who tirelessly maneuvers his wheel chair through the formations with the other 220+ members of the Cardinal Marching Band. Mr. Hughes attends every practice and game with Patrick and learns all the drill. Patrick focuses on his playing while his father is focused on being his son's eyes and legs. Mr. Hughes works an overnight shift at UPS, getting four or five hours of sleep so he can attend Patrick's classes and rehearsals with him all day. Patrick's mother, Patricia Hughes, works full time, while taking care of the household, Patrick's medical needs and two brothers, Jess and Cameron. Patrick John Hughes, his wife Patricia Hughes and sons Patrick Henry, Jesse and Cameron were all on hand for the award presentation. Members of the University of Louisville marching band, under the direction of Dr. Gregory Byrne, and including Patrick Henry Hughes, performed "My Old Kentucky Home" prior to the presentation and introduction of Hughes by Music for All President and CEO Scott McCormick. "I'm just a parent of a young man that wanted to be in band," said Hughes. "I'm truly humbled beyond words that Music for All is choosing to honor me in this way." "The commitment and support of music parents are vital to the success of students achieving their goals," said Scott McCormick, President and CEO of Music for All. "Music for All's Parent/Booster Award shines a spotlight on that dedication. We are honored to name this award to honor Patrick John Hughes." Just two days before the award presentation, the Hughes family moved into their new house in Louisville, as part of ABC's "Extreme Home Makeover." 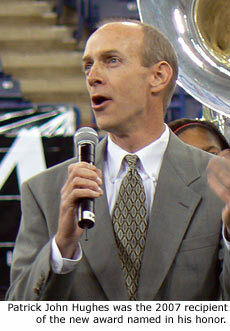 The University of Louisville marching band's practice field was also renovated for the show, which is scheduled to air February 17, 2008. About Music for All: Nearly 300,000 teens, family members and enthusiasts attend Bands of America and Music for All events each year with more than 100,000 teens and teachers participating. Hundreds of thousands worldwide access Bands of America and Music for All through award-winning national newsletters (published four times annually), Web site (www.musicforall.org), video productions and other print materials. Music for All is headquartered in historic Union Station in the Wholesale District of Indianapolis. Text provided by Music For All. Photos by Marching.com.